SKU: TDFGJ. 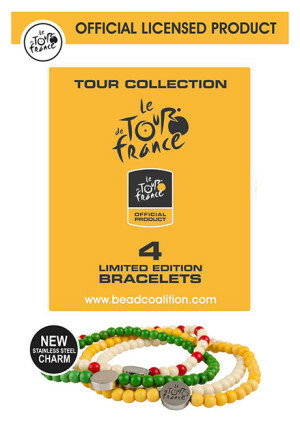 Category: Le Tour de France. 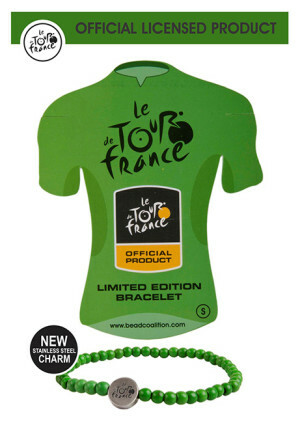 Le Tour de France pantone specific ‘GREEN JERSEY’ turquoise bead bracelet. 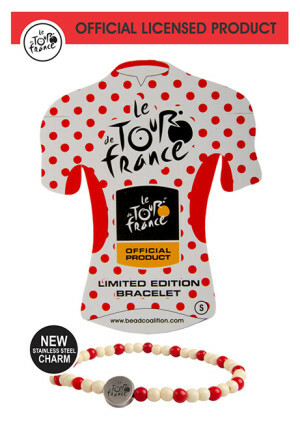 OFFICIAL new stainless steel disc charm with OFFICIAL Le Tour de France laser logo. The green jersey, or maillot vert, is the sprinter’s jersey. At every stage, points are awarded to the first 10-25 riders that cross the finish line. The amount of sprint points awarded depends on the day’s course (a flat course produces more points than the mountain terrain) and in what place the rider finishes that day. Some stages have mini-sprints within the stage that are worth points. German Erik Zabel holds the record for winning the final green jersey in the Tour six consecutive times, between 1996 and 2001.